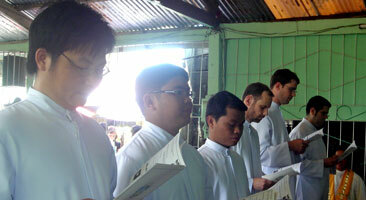 On Mar 25, the Annunciation feast, at the Society of Mary's international, English-speaking novitiate in Davao, Philippines, six young men took their first vows as Marists on Mar 25.
with novitiate staff and superiors. Fr Joachin Fernandez and Novice Master, Fr Pat Breeze, speaking during the profession ceremony. 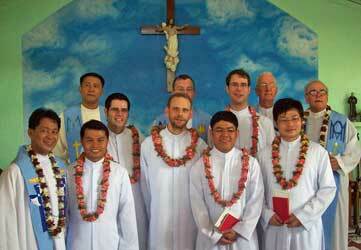 The newly-professed Marists are John Guo Wang, Niňo Memorial and Roque Rebito (District of the Philippines), Daniel Fernandez and Thilo Saft (Province of Europe), and Philip Bennenbroek (Province of New Zealand). Venue for the ceremony was the tiny San Nicolas' chapel, close to the novitiate at Dumalag, Davao city in the Philippine's southern province of Mindanao. Presiding over the ceremony was Philippines District superiror, Fr. Larry Sabud SM, assisted by Frs Joaquin Fernandez SM (Europe) and Fr. Brian Cummings SM (NZ), who received the vows from their respective novices. About 200 people from the local community, the Marist family and many other guests took part in the Mass and meal afterwards back at the novitiate. A fine meal, speeches, the cutting of the cake and a lot of singing all contributed to a very happy gathering of all present. In coming days the new Marists will return to their respective communities in the Philippines or overseas. Five young Marists took perpetual vows in the Society of Mary in a ceremony on Mar 20 at Pacific Regional Seminary, Suva, Fiji. All are members of the Marist College community and students at PRS. 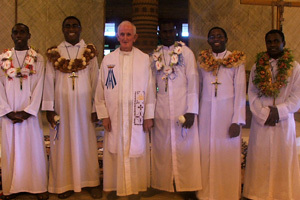 The are pictured with Irish Marist, Fr Larry Hannan SM, from left: Raymond Raupépé (Vanuatu), Emeri Ratucoko (Fiji), Christopher Ketsore (Bougainville), Christian Abongbung (African Mission District), and Ashton Koleman (Bougainville). 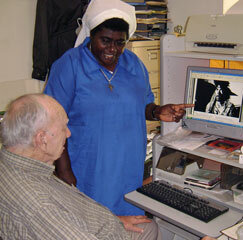 Visiting religious and director of the Nazareth Centre, Chabai, Sr Lorraine Garasu CSN, takes time out to help Fr Kevin Kerley SM in recording the events of Bougainville's crisis period of Nov 1988 - Oct 1997. Identifying photos and documents of the crisis period Sr Lorraine has enabled Fr Kevin to bring the project closer to completion. 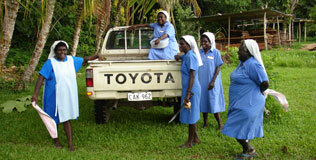 Several international groups have acknowledged Sr Lorraine's contributions to Pacific peace and development in recent years. In 2009 the USA State Department listed her among the 'International Women of Courage' while Germany-based 'Bread for the World' included Sister in their 'Fifty heroes making a difference' awards. In 2000 Sr Lorraine was given the PNG government's Silver Jubilee award for youth leadership and service to women in Bougainville. Sr Lorraine (left) near the Nazareth Centre, Chabai / With Marist Mission Centre leadership training graduates at Tsiroge, Bougainville. In his role as Bursar-General of the Society of Mary, Rome-based New Zealand Marist, Fr Kevin Mowbray, is visiting Australia to meet with Marist finance personnel in the Pacific region . Above: Fr Kevin (second from right) with Australian province finance committee representatives Tony Biddle (provincial business manager), Peter Ward (finance committee) and Fr Paul Cooney (provincial). 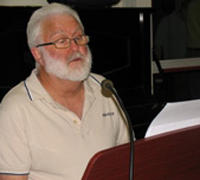 The Conference of Leaders of Religious Institutes in New South Wales (CLRI) has elected Australian Marist provincial, Fr Paul Cooney SM, as their 'president-elect'. 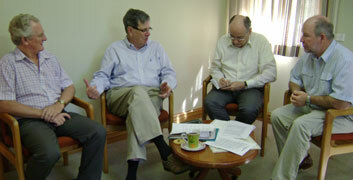 This means that Fr Paul has been designated for the key leadership role of CLRI in 2011. The conference represents over ninety religious congregations in NSW: sixty-one women's, seven brothers' and twenty-four priests' orders. One Sydney family responded to a visit to the web site story with dozens of books for the hospital so that Fr Gavin could return with his arms full. Kiwi Marist missionary, Fr Tony O'Connor SM, has spent several days in Australia during a holiday break from the Marist mission district of Peru-Venezuela. Former district leader of the mission, Fr Tony presently cares for children at Jean-Claude Colin school in Valencia, Venezuela, where the Marist Fathers work amongst the poorest of the poor. See 'A second floor for JCC'. 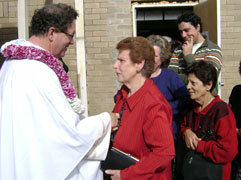 During his visit Fr Tony visited Peruvian families in Sydney. When Fr Kevin Bates SM was called to Rome last year to be liturgy coordinator for the Marist General Chapter, no-one knew how fruitful this would be. 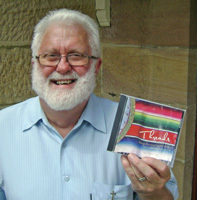 Well known for decades of musically-oriented ministry Fr Kevin took leave of Holy Name of Mary parish, Hunters Hill, NSW, to help international confreres focus on key Marist issues. Throughout the course of the Chapter Fr Kevin put daily themes into song, mirroring to the delegates the issues they were addressing. The songs are now available on the recently-released CD, 'Threads'. As well as skillfully capturing the Chapter themes the album combines gentle melodies, classic modes and up-beat tunes offering easy listening and Marist insights for all. Above: Fr Kevin in Rome last Sep/Oct. 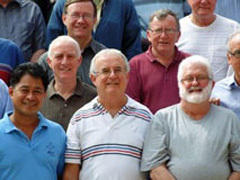 Participating in the combined Marist congregations' mif-life renewal program at Manziana, Italy, will be Australian, Fr Pius Jones SM, former parish priest of St Paul's, West Sunshine, Victoria. Located just outside of Rome, Manziana is the spirituality centre of the Marist Brothers. Fr Pius will join Fr Chris Skinner (NZ province), Fr Patolo Matiasi and Br Petelo Sanele Sekeme (Oceania province) and Fr Roger Kasiama (Africa Mission District) and fifteen others for the five-month program.